The Episcopal Church Women of the Diocese of Los Angeles established an education fund for deacons in honor of retiring Bishop Suffragan Chester L. Talton during the group’s 114th annual meeting March 6, 2010 at the Cathedral Center of St. Paul. 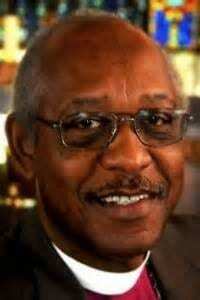 Talton was installed in 1991 and had assisted Diocesan Bishop J. Jon Bruno in the oversight of the ministries of the diocese of Los Angeles with special responsibility for ministries to deacons, higher education, Episcopal Schools and social ministries. Wanting to honor his work within the diocese and in particular his dedication to the deacons of the diocese, the Episcopal Church Women of the Diocese of Los Angeles established a fund in his honor to assist Deacons and those studying to become deacons in their education. “Bishop Talton has been so supportive of the ECW and of deacons that we thought it fitting to honor him in this way,” said outgoing president Kay Alexander, a parishioner at St. Mark’s Church in Upland. 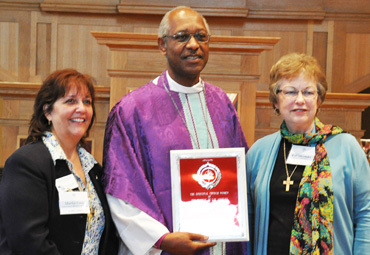 The ECW presented Talton, who retired in June 2010, with a plaque commemorating his nearly 20 years as Bishop Suffragan and his support of the organization. Incoming president Martha Estes said the ECW would match the amount given at a special offering during the Eucharist to begin the deacons’ education fund. Additional money is allocated from the annual Fair Share Campaign and individual contributors. Applications for scholarships are accepted twice a year, deadlines are April 1 and August 1. Awards range from $100 to $500. Checks are paid directly to the school or program providing the education service. All deacons and seminarians are eligible to apply for this fund. If you are interested in applying, please click on the link below and complete the application.